PHUKET: A 21-year-old female student from Phuket Rajabhat University was pronounced dead upon arrival at Thalang Hospital this morning (Jan 9) following a head-on collision with a green-plate taxi. The taxi driver has admitted to police that the collision occurred because he fell asleep at the wheel of his vehicle. 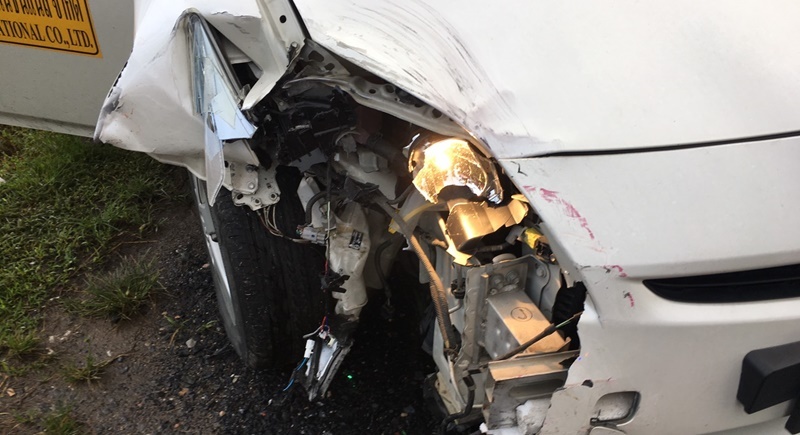 At 7:30am today, Thalang Police were notified of an accident on the Thalang-Baan Don Rd in Thapkasattri where it was reported that a green-plate taxi had been involved in a head-on collision with a motorcycle. a green-plate white Toyota Prius with its front right wing badly damaged. Nearby was a Honda Scoopy motorbike. A crash helmet was also found at the scene. 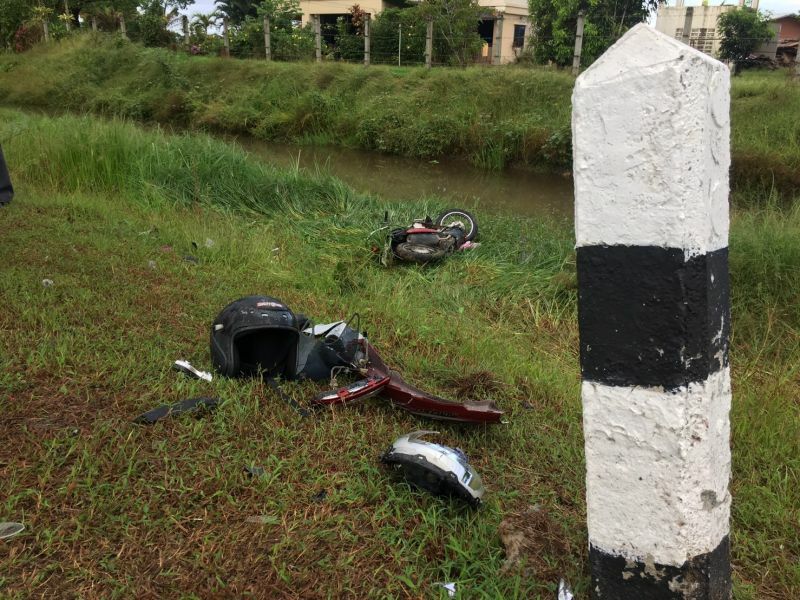 The driver of the motorbike, 21-year-old Miss Jiraporn Plordpai, a student at Phuket Rajabhat University, had already been taken to Thalang Hospital but was pronounced dead upon arrival. The driver of the taxi, Mr Anupong Janjang, 30, told police that he was returning from Phuket International Airport to his station at a hotel in Patong when he fell asleep at the wheel causing him to collide with the motorbike. “I was returning to Patong from the airport when I started to feel tired so about two kilometres from where the accident happened I stopped to take some sleep. “At about 7am I continued on my journey, but shortly after I fell asleep for just a second and when I came round my vehicle was travelling over to the wrong side of the road. I then hit the motorbike causing the bike and driver to be thrown 50 metres,” he said. Anupong is currently being questioned about the incident at Thalang Police Station. Paully44/Rorii...and who are you to tell me what to do? its monotonous for intelligent people to have to read puerile comments from idiots, then the idiots having the audacity to complain when they are corrected. Joe12, I guess ematt asked you to speak for him, the problem is, you completely missed my point, basically, and as simply as I can put it... if you don't like it, don't read it, how simple is that, it's no good whinging/whining/complaining if you continue to torture yourself, it makes more sense that requesting the comments to be closed, don't you think?, mmm . Got to agree with Pauly44, it's becoming tiresome and monotonous! Joe 12 you & swerv really should get a room and sympathize together, at the very least stop posting your comments as what you have to say is rather uninteresting and all too predictable, very boring stuff having zero relevance to the story whatsoever. Also if you guys can't understand Kurt's comments perhaps it's you who are the idiots as others don't seem to have an issue. ematt, it is a little disturbing when someone, like yourself, tortures themslves, by reading something they don't lime, the complain/whinge about it, then requestes for a comments section  to be closed, I'm  sure they is a clinical term for it, and perhaps some medical intervention to help those tortured souls. Andy: Not sure what your point is, what is wrong with GFY...Good For You? Dear Editor:  Please do get rid of the comments section. It's the same 5 or 6 people who always post. And all they ever do is complain endlessly about Thai people, Thai culture, Thai government, Thai brains, Thai thinking, Thai laws, Thai police, Thai drivers, Thai motorcycle helmets and now - wait for it - Thai nutrition and neural development. PN, with respect, please, can you correct Eagle? I, Kurt, are NOT Eagle. I find this highly disturbing what Eagle wrote about being me. I can't possible see this writing of Eagle as a comment on the PN article. @ Rorii,   I, Kurt, am NOT Eagle! Rorri: The incidents mentioned relate to many years ago when i was driving across Europe. Each time i only fell asleep for a few seconds and no harm done. The point i was making is that it can happen to anyone and i expect it has happened at some time to most of the readers on here. Capt B It is highly unlikely a full face crash helmet would have saved this poor young lady in a head on crash, it likely broke her neck and the additional weight of a heavy helmet actually increases this risk albeit this is a small risk to pay for the benefit of face and chin protection. You ran an editorial about the comments section a while back yet you have allowed one poster to say to another "GFY". Thus you only have yourselves to blame for the lack of civility and insults that appear here. swerv, seeing how you admit, 3 times, to driving tired, it has been shown to be more dangerous than driving tippsy. Now, just to help yo, seeing as it seems hard for you to Google, " A donkey never hit the same stone twice" means "One who makes the same mistake twice is a fool," and you did it 3 times. Christy, you might be right, but one thing for sure, there is a lack of protein, in the Thai diet, and this leads to a lack of brain development, this tied to a culture of no responsibility, leads to many problems. Swerv, You are swerving again! Stating :...the killer is a brainless thai".. has nothing to do with the words you try to put in my mouth. I am not insinuating that all thai are brainless. Actually a bit dumb to try to do that, swerv. Kurt: Here you go again: "the killer was a brainless Thai". Are you insinuating that all Thai's are brainless?? You need to be careful with what you write. No need to string the guy up, he hasn't committed a criminal offence like being a drunk driver. He just pushed it a bit hard trying to earn a living & pay the bills. As a trivial fact,  the Austrian founder of red bull asked Thai taxidrivers what kept them awake and alert n they replied they drank the drink would become red bull. Maybe he should have Drunk that. Eagle, are you Joe12? Go look up the word hyperbole, it seems you just want to argue, yes just like Joe12, swerv, ematt, and that ex editor. Eagle: Do not start to swerve. .." Must have something to do with the thai brain"..,It doesn't mean  ..'all thai brains'.. You are swerving! Don't make up things with swerving. You mention about your comments! You only wrote 1 comment. Stick to issue, don't make your own swerving thai story and capsule mine. 1: I do not insult all thai people! Do you overlook what actually happened? 2: A 21 year old thai girl was killed! Do you not have any emotion/feeling  about that? Meet her parents, after that comment again, ok? 3; This it not about me, Eagle. There is no insult from my side. I didn't kill that 21 year old girl.